The official start of the 2014 Holiday shopping season is just days away and the big toy retailers like Target, Walmart, Kmart and Toys ‘R Us have once again each announced their Hot Toys lists. Of course these toys look shiny, fun and awesome online and in the stores but what about once your kid is actually playing with them? Alpha Mom picked 12 toys from these retailer’s “Hot Holiday Toys” lists to put to the test. There were some big hits (heard of Elsa anyone?) but some of them definitely did not hold up to expectations. Before you spend big money, find out which toys are our favorites and which ones are misses and should be skipped or avoided altogether. Also, we found that the prices for these “Hot Toys” can vary greatly from retailer to retailer. We gave you a general price range but check different retailers’ websites before purchasing. We already know that Elsa gets all the glory and poor Anna always seems to be second fiddle. Hopefully Anna can work it out in therapy some day. This singing Elsa doll (My First Disney Princess) ($30 – $47 depending on where you buy it) is a HUGE favorite in my house. Especially by my 4 year old daughter. If you’ve got an Elsa lover at home, this is a fabulous holiday gift. 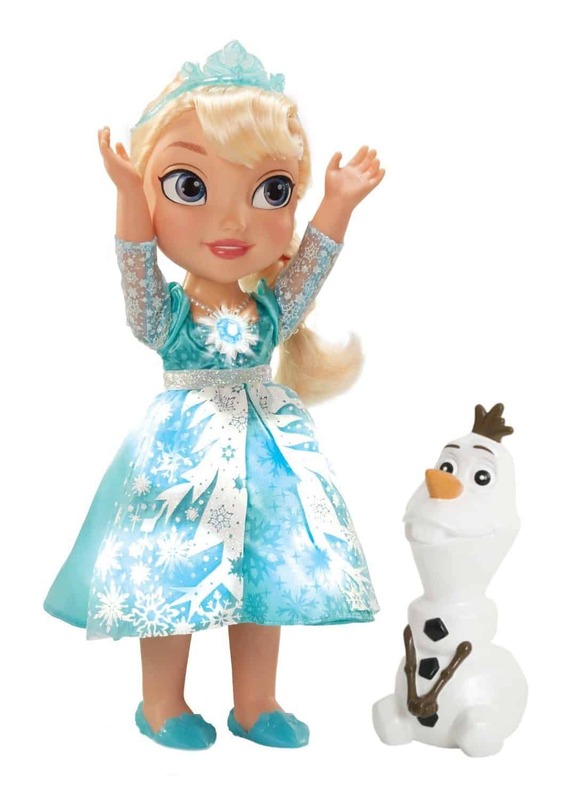 Your child can touch this doll’s snowflake necklace and hear Elsa to talk to her Frozen friends as her dress lights up. The dolls sings, “Let it Go” (just a part of the song) and says 15 phrases from the movie. You can set the doll to talk/sing in English or Spanish. This doll comes with an Olaf sidekick and three AAA batteries. Final Word on Frozen Snow Glow Elsa Singing Doll: “Frozen” mania continues and this Elsa doll is a nice addition. I have already purchased one of these for a birthday party this weekend. Definitely an Alpha Mom favorite and a Holiday Hot Toy Hit, and we’re not surprised it’s on the Hot Toy Lists of many of the retailers this holiday season. Frozen Snow Glow Elsa Singing Doll can be purchased via our affiliate Amazon. Remember that electronic dog Zoomer from last year’s Holiday Hot Toys Lists? Well, he’s back in dinosaur form this year (about $80)! The Zoomer Dino is on many retailers’ Holiday Hot Toy Lists this year (Walmart, Target, Kmart and Toys R Us.) Zoomer Dino wanders freely around your home and really has good balance for an electronic toy. This is an interactive toy that can detect when your child is playing with it. It will react when being pet and will get angry if you pull its tail! Like a real dinosaur, it will spin around, chomp and roar. You can use different hand motions to make it do things like flip its tail and sit. You can also control Zoomer Dino’s movements with a remote control. And its eyes are super freaky. 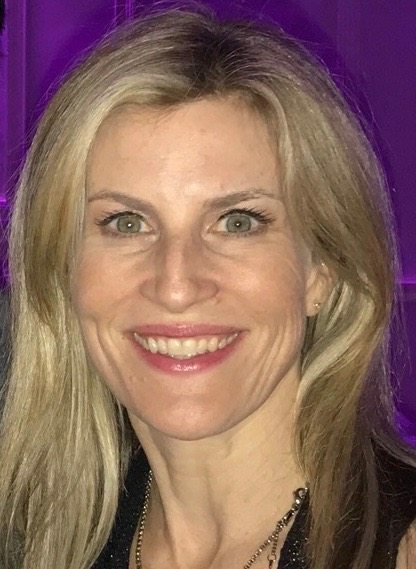 The eyes change color with its mood, indicating whether it’s happy or sad. This prehistoric pet is for children ages 5 and up (although my 4 year old son enjoyed playing with it). The toys requires three AAA batteries for the remote control (not included) and it charges with a USB cable (included). It takes about an hour to charge and the charge lasts 20 to 30 minutes. (Before recharging – you have to let the battery cool down for 10 to 15 minutes). 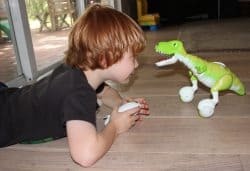 Final Word on Zoomer Dino: This toy, an Alpha Mom favorite and Holiday Hot Toy Hot, is a lot like the Zoomer dog but kind of cooler because the dinosaur can be so ferocious. If you have a kid who loves dinosaurs, this is fun, interactive holiday gift. Just keep that USB cable handy because you will be doing a lot of recharging. Last year, Zoomer (the dog version) sold out incredibly quickly so if this of interest, act fast and get your Zoomer Dino ASAP. Aside from Amazon, also look for it on Walmart. When Elmo isn’t wearing a hat, he still interacts with your child by getting bounced, tickled, and having his nose squeezed! The whole thing is ridiculously cute but didn’t really hold my children’s interest for long. I found the same issue with the Big Hugs Elmo which was on many retailers’ hot toy lists for the holidays last year. 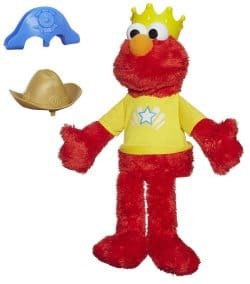 All my kids (age 18 months to 10 years old) were anxious to play with the Let’s Imagine Elmo but after checking out the different hats were done. Also young kids (age 4 and under) will have trouble getting the hats on and off so they will need assistance from an adult. Four AA batteries included. Final Word on Let’s Imagine Elmo toy: This is a really cute gift for a preschooler who LOVES Elmo. But unless the kid is obsessed with Elmo, skip this toy because your child will lose interest fast. I know a lot of people grew up playing Simon (about $15) and I remember it but didn’t play it much. I think I was too busy agonizing over that infuriating Rubik’s Cube. 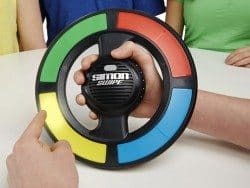 But I’m always a fan of a retro game so I was excited to try out Simon Swipe with my kids (It’s on the Hot Toy List of Target and Kmart this year). Simon Swipe has four games including Classic Simon. If you’re not familiar with the game – you basically need to repeat the pattern of lights which gets longer and more challenging as you get each pattern right. In the classic game, you just tap. But in the other games now available, you tap, swipe and do u-turns. Yup, it gets that crazy. They really should put some basic directions on the bottom of this game because it would be nice to be able to easily refer to it. We all got a little confused about how to choose and restart different games on Simon Swipe and constantly needed to refer to the directions which at some point I know will get lost. One feature of Simon Swipe that I love is that you can turn down the volume or even turn it off completely which makes it a great car game. The game is for ages 8 and up, but younger kids can play the Classic Simon module. Three AA batteries included. Final Word on Simon Swipe: My older kids (ages 7 and 10) played the Classic Simon module because the other games got too confusing and challenging. I like that Simon Swipe is great for memory skills and it’s easy to bring on a road trip. With the retro vibe and affordable price, it’s definitely an Alpha Mom favorite and a Holiday Hot Toy Hit. 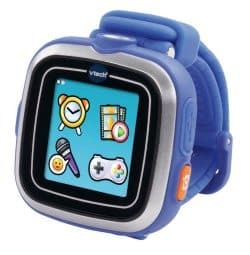 The VTech Kidzoom Smartwatch (about $50) is a big touch screen wristwatch with a camera, voice recorder, games and other creative effects. Hey, it even tells time! This is really a way to keep younger kids (age 3 to 7) off your cellphone. (It’s on Walmart’s and Kmart’s Hot Toy Lists this year). My children (age 4 to 10) all had fun experimenting with this smartwatch and had no problem figuring it out. They were able to take pictures and videos. You can pick different frames for the photos, save them and transfer them to a computer if you want. The digital and analog watch clock displays comes with 50 clock face designs and there is also a stopwatch/timer. The voice recorder has funny voice-changing effects which my kids loved! There are four learning games: Super Detective, Rotating Puzzle, Finger Dance, and Time Master and you can download more by registering online and connecting to the Vtech Learning Lodge. You don’t have to worry about batteries. You just plug the Vtech Smartwatch in using a USB cable. It takes about 3 hours to charge and the battery will last 2 to 3 days under typical usage. Although be warned – taking photos and videos are more demanding on the battery. The watch seems pretty durable and is splash-proof. Don’t bring it in the bath or swim with it. The user manual is comprehensive and easy to read which as a parent, I really appreciate. Just so you understand the size of the watch, this is it on my 4 year old son…. I wouldn’t buy this device if your priority is giving your kid a way to tell time. Just buy a standard wristwatch. But this is a great toy to attach to a younger child’s wrist to keep them busy in the car or when you are waiting for a doctor’s appointment. Because you can actually attach it to your child, it’s easier to keep track of it. Final Word on the Vtech Kidizoom Smartwatch: I’m always looking for ways to decrease screen time– not increase it– but I thought this was a nice twist on technology that could be great on a car trip or when you need to keep little ones busy for awhile. The Vtech Kidizoom Smartwatch is an Alpha Mom favorite! There was mass hysteria in my house when the FurReal Friends Get Up & GoGo My Walkin’ Pup Pet (about $50) arrived. My five kids were very excited and immediately started fighting over who could walk it first. (This toy is on the Holiday Hot Toy Lists of Target, Walmart, Kmart, Toys ‘R Us, and Toy Insider). This plush, electronic puppy is designed to act like a real puppy. A leash with a controller allows your child to walk her. She also wags her tail, sits and tilts her head. The dog also responds with barks when you talk to her. Four C batteries required. The key problem with this furry pup toy is that it can only walk in a straight line so when your child wants to turn, they will either have to physically pick her up and turn her or try dragging her with the leash which just makes her fall over. So it gets a little frustrating trying to walk her. It’s also pretty slow going. You do not have a greyhound dog on your hands here. This pup also comes with a free app. After you download the app (works with Apple and certain Android devices), face your phone/tablet toward the dog and she will interact with the activities your child plays on the app like washing and drying the pup. There are no instructions so you kind of just wing it – your kids will figure it out in no time. I wasn’t too jazzed about the app because I’m not looking for more ways to increase my kids’ screen time. I’d rather they just play with the dog and use their imaginations. All of my kids quickly lost interest in the FurReal pup except for my 4 year old daughter. Not surprising, since she’s an animal lover and still adores the FurReal Friends Cuddles My Giggly Monkey Pet that was on many retailers’ Hot Toy lists in 2013 and was a favorite of ours. Still she kept saying, “The puppy only walks in a straight line!” My 18 month old son also liked playing with it a bit because it’s interactive. 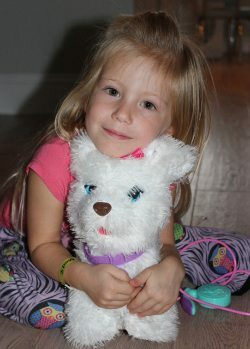 Final Word on the FurReal Friends Get Up & GoGo My Walkin’ Pup Pet: If this was $20 or $30 bucks, I’d absolutely recommend buying the toy pup for a young child (aged 2 – 5) who is passionate about dogs. But at $50 it seems too expensive for what you’re getting. And it also won’t stop your kids for asking for a real dog. Which is the real bummer. It’s not often that you see a really new idea when it comes to baby/toddler toys. But I was intrigued to check out this Fisher-Price Laugh and Learn Smart Stages Chair (about $48) for kids 12 months and up because I’ve never seen anything quite like it. It’s on the Hot Toy List this year of Toy Insider. 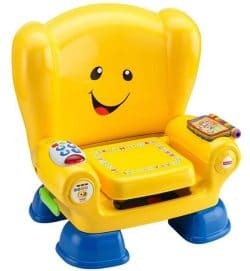 This seat knows when your toddler sits and stands, activating songs and phrases. Your child can press the light-up remote or flip book pages to hear numbers, shapes and more. Lift the cushion for more songs and interactive play. There are three levels of play (with different songs, phrases and sounds) depending on your child’s age. Requires three AA batteries. I really like the idea of this toy but my 18 month old never sits down. Like ever. Unless he’s strapped into his high chair or the carseat, he is roaming around and causing trouble. He was interested in the Laugh and Learn Smart Chair when it first arrived but has mostly ignored it since then so he can focus on his never ending effort to get into the trash cans. My daughters were a bit more sedentary at age 18 months and may have played with a toy like this for longer. Final Word on the Laugh and Learn Smart Chair: I wouldn’t be so quick to throw down $48 for this chair unless your toddler has the ability to sit down for a little bit and play with toys. If your kids is a more of a “search and destroy” toddler then this might not be the perfect fit. Available at our affiliate Amazon. The Sew Cool Sewing Machine (about $30 – $40) is a super cool concept and is on Walmart’s Holiday Hot Toy List this year. It’s a threadless machine that kids can use to create purses, pouches, characters and more out of precut shapes. There is no thread, no foot pedal or bobbins to wind. You simply place the material in the machine, press the button and follow the dotted line. There are 9 included projects. Four AA batteries required. Unfortunately, this toy seems to be 100% targeted at girls only. A product description begins, “Girls can start sewing in a safe and creative way!” They only show a girl enjoying the product and it just comes in a deep pink and purple because you know that’s the only color girls like, right?! Ugh. My 7 year old daughter’s favorite color is blue. And haven’t these folks ever seen “Project Runway?” Don’t they know that lots of talented and creative little boys will grow up to be designers too?! Insulting 1950’s marketing aside, my 7 and 10 year old daughters enjoyed this. Although it was a little hard to get the material in the right spot sometimes. I have no idea how the material sticks together but apparently it works like a felting machine which blends the fibers together. BUT – by the time a kid is old enough to use the the Sew Cool Sewing Machine (6 and up), why not teach them to sew for real? There are adorable products where kids can start using a needle and thread like My First Sewing Kit by Alex’s Toys or American Girl Crafts Sew and Stuff Kit. Or craft stores and other small businesses will teach you or your child how to use a sewing machine. My 10 year old started taking sewing lessons a couple of months ago and she has already made a bag, shorts, a skirt and a top! 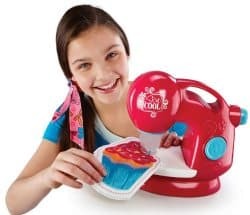 Final Word on the Sew Cool Sewing Machine: I think this is a fun toy for a kid who has expressed an interest in sewing and wants the feel of a real sewing machine. But I can’t overlook how it is entirely marketed to only girls and kids aren’t learning any real sewing skills. But that aside, it’s a nice break from all the screens/apps, and I’d still recommend it for the future “Project Runway” star. You can purchase the Sew Cool Sewing Machine through our affiliate Amazon. The Ultimate Amazement Park Playset by Vtech (about $50) is on the Hot Toy lists of Target and Walmart this year. We found that it is way bigger than you think it will be. 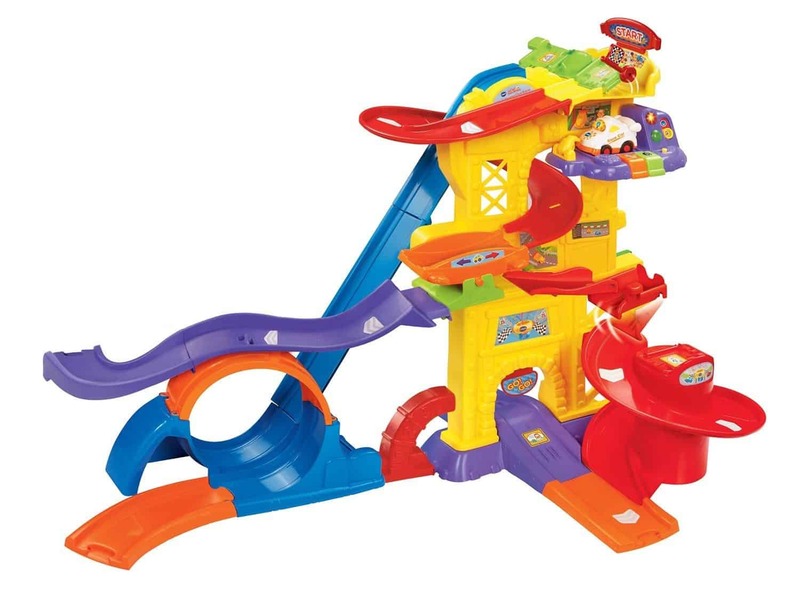 In fact, it’s 3 feet long with ramps, loops and a spiral course (!!!). It has lots of fun sounds and melodies. But you’ll barely notice because you’ll keep saying to yourself, “Wow. This is really big.” Unless you’re living in Daddy Warbucks’ mansion, you will have a hard time figuring out where to put this thing. And because it’s so tall, it’s a bit unsteady and ours kept crashing over. So a lot of the time, it looked like this…. It’s pretty easy to put together which is always a big plus when it comes to toys. You can follow the picture on the box and definitely keep the box for storage. My 4 year old son thought the playset was pretty cool but it only comes with one car, which is not enough. He used his matchbox cars on it too. Two AAA batteries included. Meant for kids 12 months to 5 years but we think it’s really for kids 3 and up. My 18 month old only knocked it over. Again and again. Final Word on Ultimate Amazement Park Playset: Unless you have a big playroom or space for this, I would skip it. If you have space to leave it up, and your child is into cars and racetracks, it could be a lot of fun. The Ultimate Amazement Park Playset can be purchased on Amazon. My kids have never used any of the DohVinci products so they didn’t really know what to expect. The Play Doh DohVinci Anywhere Art Studio (about $26) is a cool toy gift for kids who love to do anything artistic and is on Toys R Us’ Hot Toy List this year. Basically your child is squeezing out Play Doh through these Deco Pop tubes to create 3D designs. They can either follow the designs on three different art boards or create their own on two blank boards provided. Your child can add dots, zigzag lines and other details. It’s a little harder than it looks and my 10 year old daughter was frustrated that she couldn’t make the lines exactly the way she wanted. My 4 year old had a really hard time squeezing the Play Doh out with the styler. My 7 year old could do it but had to use two hands. The creations harden overnight and then you can keep them forever! I know. You’re welcome. This non-toxic Play Doh contains wheat. Final Word on DohVinci Anywhere Art Studio Easel and Storage Case Set: This toy cannot be used simultaneously by several children because you only have one styler to put the deco pop tubes into to create your art. So if you have several children, they will need to exercise some patience before trying it out or you may need to purchase additional stylers. My kids enjoyed experimenting with this toy but I think they have more fun with construction paper, some water colors and glitter glue. The Play Doh DohVinci Anywhere Art Studio is available for sale at our affiliate Amazon. 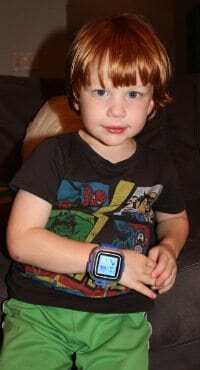 The LeapFrog LeapBand is considerably less money than the Vtech Smartwatch. The LeapBand only costs about $30. But despite the fact that the LeapFrog and the Vtech watches look very much the same and are targeted at the same age group (LeapBand targets age 4 – 7), it really is a different product. The LeapBand is intended to be an activity tracker for kids. The idea of LeapBand is that kids run, jump and play to earn rewards and power a pet pal that lives on the band. For example, in one game, Pet Chef, your child can help a pet collect food and make healthy snacks. Parents can set the LeapBand so that it is locked during quiet times (when your child is at school and sleeping). Parents can also check their kid’s activity by connecting the LeapBand to their computer and logging onto LeapFrog Connect. You charge the phone by plugging it in to the computer using a USB cable. The battery will last 3 to 4 days depending on usage. 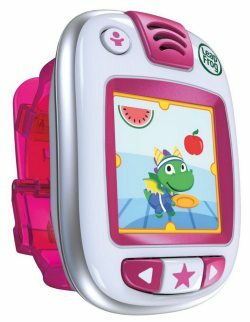 I am not a big fan of this watch – despite the fact that I love the LeapFrog brand and really adored the LeapPad Ultra reviewed last year on Alpha Mom. The watch is huge and the band is very stiff. Is a kid really going to wear this all day? No. And more importantly, why would you want them to? I let my 4 year old twins, my 7 year old and my 10 year old try the LeapBand (even though the 10 year old is above the targeted age group) and I didn’t see a lot of activity. What I saw was a lot of kids staring at screens. And yes, once in a while, they were jumping and doing short activities. But mostly they were playing these pet pal games while lounging on the couch. You want your kid to be more active? Save yourself $30 bucks and send them outside to play tag, a game of soccer or go on a bike ride. Or if you’re stuck inside, how about an active game on the Wii or a trip to your local Y. Final Word on the LeapFrog LeapBand: I think the idea of an activity tracker for kids is brilliant but this just didn’t quite get there. I love the idea of this Look-out Playset (for about $30) because so many kids enjoy the show “Paw Patrol” on Nickelodeon. (This is found on the Hot Toy lists of Target, Kmart and Toys R Us). And my 4 year old twins (boy and girl) were really excited to play with it. But it’s kind of a piece of junk. 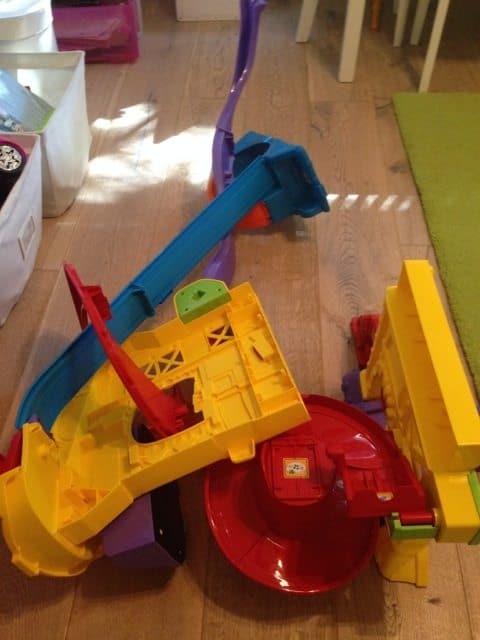 The main problem with the toy is that the slide breaks apart again and again. I finally resorted to using duct tape to keep it together but the slide still won’t stay attached to the playset. A scan of Amazon reviews shows that many people had this same issue. Other than that major problem, it’s cute. It has an elevator, lights and sounds and a working Periscope. It also includes a Chase action figure and his police SUV. It comes with three button cell batteries. 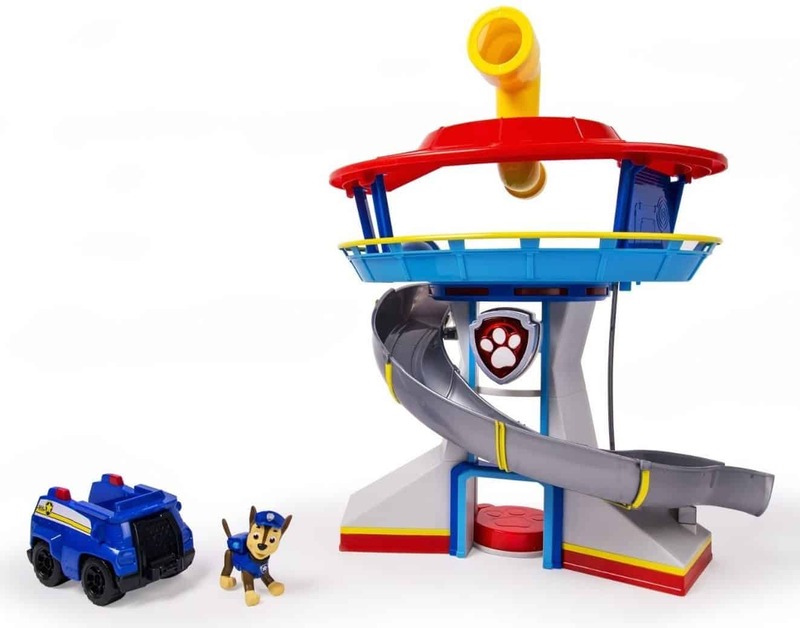 Final Word on the Paw Patrol Look-out Playset : If the manufacturer can fix the toy’s slide problem, then this will be a big hit. But until then – definitely skip this toy and maybe try one of the other “Paw Patrol” toys on the market. Which of the toys would I buy for my kids? I think the Frozen Snow Glow Elsa Singing doll is a hit for this holiday season, along with the Zoomer Dino and the Vtech Kidzoom Smartwatch. I also like the Simon Swipe for some family, retro fun. Also, if you have a big Elmo fan on your hands, then the Sesame Street Let’s Imagine Elmo is a cute toy to purchase. Thanks so much for this list. I am having such a hard time this year coming up with good gift ideas for my kids. I looked up the Elsa doll and Zoomer. On amazon Elsa was at least $65, and Zoomer was $100. Where else can I order these from? We don’t live near any stores (the closest mall is 1.5 hours away). All of my shopping is online and I usually do amazon. Thanks for giving me the heads up about the rising prices on Amazon, Ally. I looked into it and it looks like the Elsa doll is sold out right now in Target, Walmart, and Toys R Us and that’s why the price is rising on Amazon. However, the Zoomer Dino is still available at its regular price of $80 on Walmart. For about an hour yesterday they were on sale on Amazon for $23. I snatched one up! Thanks for the suggestion. My daughter will be thrilled.